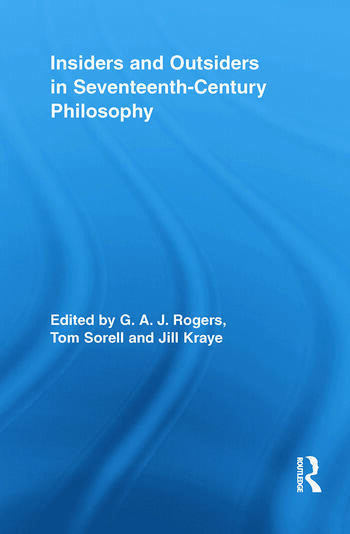 Seventeenth-century philosophy scholars come together in this volume to address the Insiders--Descartes, Spinoza, Leibniz, Locke, and Hobbes--and Outsiders--Pierre Gassendi, Kenelm Digby, Theophilus Gale, Ralph Cudworth and Nicholas Malebranche--of the philosocial canon, and the ways in which reputations are created and confirmed. In their own day, these ten figures were all considered to be thinkers of substantial repute, and it took some time for the Insiders to come to be regarded as major and original philosophers. Today these Insiders all feature in the syllabi of most history of philosophy courses taught in western universities, and the papers in this collection, contrasting the stories of their receptions with those of the Outsiders, give an insight into the history of philosophy which is generally overlooked. G. A. J. Rogers is Editor of the British Journal for the History of Science, and a Professor of the History of Philosophy at Keele University. Tom Sorrell is Professor of Philosophy at the University of Birmingham. Jill Kraye is Professor of History of Renaissance Philosophy at the Warburg Institute.